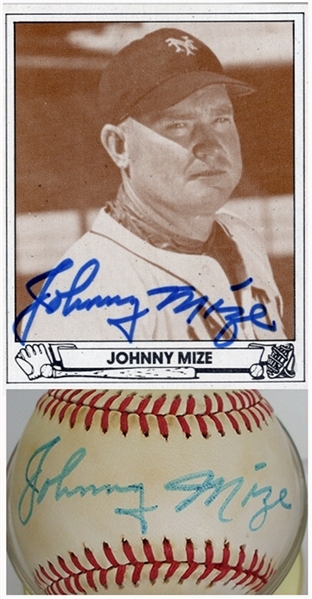 Baseball and baseball card signed “Johnny Mize” by John Robert Mize (January 7, 1913 – June 2, 1993), nicknamed Big Jawn and The Big Cat, was a baseball player who was a first baseman for the St. Louis Cardinals, New York Giants, and New York Yankees. He played in Major League Baseball (MLB) for 15 seasons between 1936 and 1953, losing three seasons to military service during World War II. Mize was a ten-time All-Star. Late in his career, he played with the Yankees when they won five consecutive World Series.